Sitting peacefully by the lake, this adult radiates strength; a cruel beak is slightly open, and long talons rest extended on the grass. Lapsing into a quiet sleep, the hippogryph adult lies back, beak clacking together every so often as it dreams of hunting. A horse's tail twitches at insects, hooves moving slightly as this large beast chases something in its sleep. You brush away flies from its flanks, stroking your companion's muscled back. Its blue coat feels almost like velvet, and you can smell the musky aroma of horse, somehow comforting. After a time the small animals relax and begin to come out, squirrels and chipmunks soon busy at work gathering nuts. A small bird hops too close in search of worms, and in moments the hippogryph is up and chasing it, disappearing into the forest swiftly and loudly. You stand up, peering into the shadows, waiting for the hippogryph to reappear. You can hear branches snapping as the large animal crashes through the undergrowth. When it tires from running, or has lost its prey, it slowly lopes up to you, sides heaving, begging for food. Apparently the bird was lucky today. 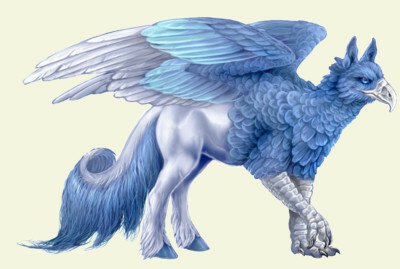 Gryphons and pegasi rarely mate, but the match can result in beautiful offspring. With the predatory head of a gryphon and the powerful body of a horse, this creature possess unnatural strength and the magical abilities of both species. Their abilities to carry a rider both in flight and on land make them valuable companions. They are as equally content in the sky as on the land, their massive wings allowing them to fly just as far and high as their gryphon parents. Their front limbs, like those of giant birds, make prey easily captured. When the shadow of these creatures sweep across the ground, a flurry of small animals run for cover. Hippogryphs eat mostly meat, and are quite capable of supplying themselves with their own meals. Most of their time is spent hunting for and eating small game, and their predatory instincts are rather sharp. These animals must be properly trained since birth, for an untamed hippogryph can be extremely dangerous. They are very loyal, and become snappy when strangers approach their magi. There are three variations of their coloring; this one is blue, light blue, and moon white.